The slow cooker can be your best friend in the busiest of times. While you are busy at work, helping kids with homework, and picking up the house, the slow cooker is lending a hand by ensuring dinner will be ready whenever you are. 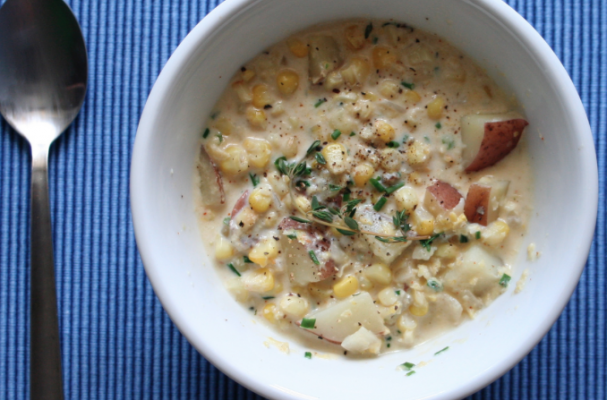 This vegetarian recipe for slow cooker potato and corn chowder is a particular favorite in my house. Chopped red potatoes and corn are thrown into the crock pot with some vegetable stock, herbs and aromatics. The soup bubbles low and slow for many hours until the potatoes and onions become tender and the flavors meld together. I like to throw in some freshly chopped flat leaf parsley at the end to add a fresh flavor to the chowder. You can serve this chowder on its own or in sourdough bread bowl. In a slow cooker, place chopped potatoes and frozen corn. Toss the ingredients with the flour and make sure it is evenly distributed. Stir in vegetable stock, thyme, oregano, garlic (or garlic powder), onion powder, salt and pepper, to taste. Cover and cook on low heat for 7-8 hours or high heat for 3-4 hours. Stir in butter and heavy cream just before serving. Serve immediately. Note: For a southwestern twist, add 1/2 cup chopped red peppers and 1 4 oz can of chopped green chiles. To convert this into a chicken chowder, replace the vegetable stock with chicken stock and add two cups of chopped chicken to the soup.